Construction of the Dennison Railroad Shops began in 1864 with the Pittsburgh, Cincinnati and St. Louis Railway. The location of the rail yard was specifically chosen because it is exactly 100 miles from Columbus and Pittsburgh. In the days of steam locomotives, 100 miles was about the maximum distance the locomotive could cover before refueling. This line was later incorporated into the Pennsylvania Railroad in 1870 and the Depot was constructed in 1873.The Dennison Depot is listed on the National Register of Historic Places. The depot experienced its busiest time between 1900 - 1921. At this time the railroad yards were one of the most complete railroad shops in the country and included 40 acres of shops. Twenty-one passenger trains and 21 freight trains passed through the yards every day. During World War II, the station played a vital role in transporting troops for the war effort. The Salvation Army operated a 24/7 canteen in the station everyday from 1942 to 1946, serving more than 1.3 million GIs. 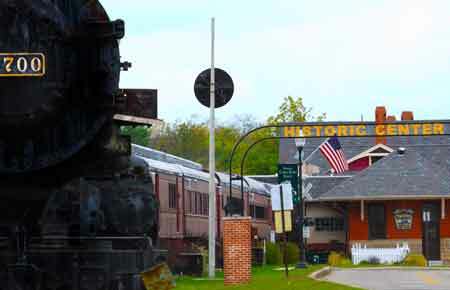 The canteen was staffed by 1000s of volunteers that so endeared the servicemen that the Dennison Railroad Depot got the nickname of "Dreamsville, Ohio." The last passenger trained stopped there in 1970. In 1970, the Ohio Central Railroad Systems revived the line in 1992 operating as the Columbus and Ohio River Railroad. Since that time, tourist train excursions have operated on the line, and attention has focused on rebuilding the freight business. The Depot now houses a Museum, Restaurant and Gift Shop which are all open year round. The Trax Diner offers a wide variety of selections and the Whistle Stop Gift Shop is an excellent source for railroad gifts, WWII Memorabilia and Americana.